Take No Chances | BIG Enterprises Inc. In a world where leaving our very homes can pose a risk to our safety, people find themselves increasingly on guard when in a public setting. Event planners and managers are faced with the need to increase security to minimize any risk to the attendees of their events. While the task seems daunting, this can be done in a multitude of ways. We are an on-the-go society these days, and events are no exception. Many events, such as carnivals or music festivals, set up camp in a temporary location or are consistently moving from place to place. Either way, a portable guard shack can be an invaluable addition to an event venue. 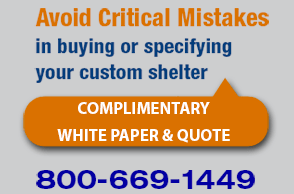 Custom prefabricated mobile guard shacks offer several advantages. First, you get to specifically design the best option for you and your event; secondly, the shack comes with you when your event moves on to its next location. Guards at the entrance to your location, whether temporary or permanent, can serve as a visual deterrent to would-be troublemakers. Guards can also observe attendees exhibiting suspicious behavior without distractions from the safety of a portable guard booth. Professionals that are being trained in event management and planning are usually required to learn the skills of risk management. When it comes to risk management, it’s critical to consider all the worst-case scenarios and be prepared to handle each one. Having a solid plan before any event takes place also gives event staff the opportunity to train for these scenarios, receive suggestions from security staff, and become familiar with the planned security strategies. Planning not only gives staff the training needed to protect guests, but also insight into what staff can also do to protect themselves in the event of a security breach or crisis. For example, a portable guard shack can also become a shelter for event staff who are nearby should disaster strike. Event planners should think about many factors when implementing a plan that minimizes the risks of event attendees and staff. Are multiple guard shacks needed? Would a metal detector be an efficient addition to the security plan? A little pre-planning can save lives and prevent injuries should an unthinkable act of violence take place.